There is infrastructure in place so that your translation closely follows development. This way translators can work on translations the entire time, instead of working through huge amount of new text just prior to release. Developers make changes and push them to the VCS repository. Optionally the translation files are updated (this depends on the file format, see Why does Weblate still show old translation strings when I’ve updated the template?). Weblate pulls changes from the VCS repository, see Updating repositories. Once Weblate detects changes in translations, translators are notified based on their subscription settings. Translators submit translations using the Weblate web interface, or upload offline changes. Once the translators are finished, Weblate commits the changes to the local repository (see Lazy commits) and pushes them back if it has permissions to do so (see Pushing changes). 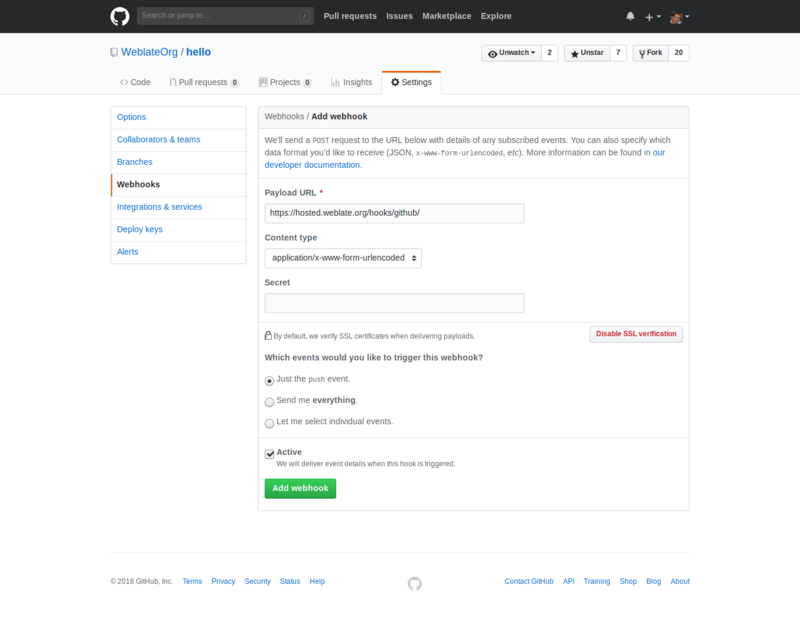 You should set up some way of updating backend repositories from their source. Either use hooks (see Notification hooks) or just regularly run updategit (with selection of project or –all to update all). Whenever Weblate updates the repository, the Post-update script hooks are executed. This merge driver assumes changes in POT files always are done in the attemptedly merged branch. Changed in version 2.9: This merge driver is now automatically installed for all Weblate internal repositories. To avoid merge conflicts, control when translation files are updated in the upstream repository to avoid Weblate having changes on the same file. You can achieve this using Weblate’s Web API to force Weblate to push all pending changes and lock the translation while you are doing changes on your side. The example uses Weblate Client, which needs configuration (API keys) to be able to control Weblate remotely. You can also achieve this using any HTTP client instead of wlc, e.g. curl, see Weblate’s Web API. Weblate comes with native support for GitHub. If you are using Hosted Weblate, the recommended approach is to install the Hosted Weblate app, that way you will get the correct setup without having to set much up. It can also be used for pushing changes back. For the payload URL, append /hooks/github/ to your Weblate URL, for example for the Hosted Weblate service, this is https://hosted.weblate.org/hooks/github/. You can leave other values at default settings (Weblate can handle both content types and consumes just the push event). 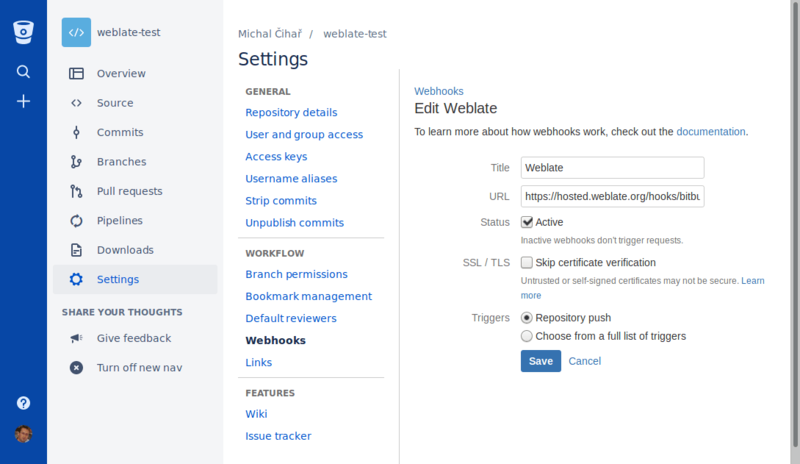 Weblate has support for Bitbucket webhooks, add a webhook which triggers upon repository push, with destination to /hooks/bitbucket/ URL on your Weblate installation (for example https://hosted.weblate.org/hooks/bitbucket/). Weblate has support for GitLab hooks, add a project webhook with destination to /hooks/gitlab/ URL on your Weblate installation (for example https://hosted.weblate.org/hooks/gitlab/). Weblate automatically fetches remote repositories nightly to improve performance when merging changes later. You can optionally turn this into doing nightly merges as well, by enabling AUTO_UPDATE. 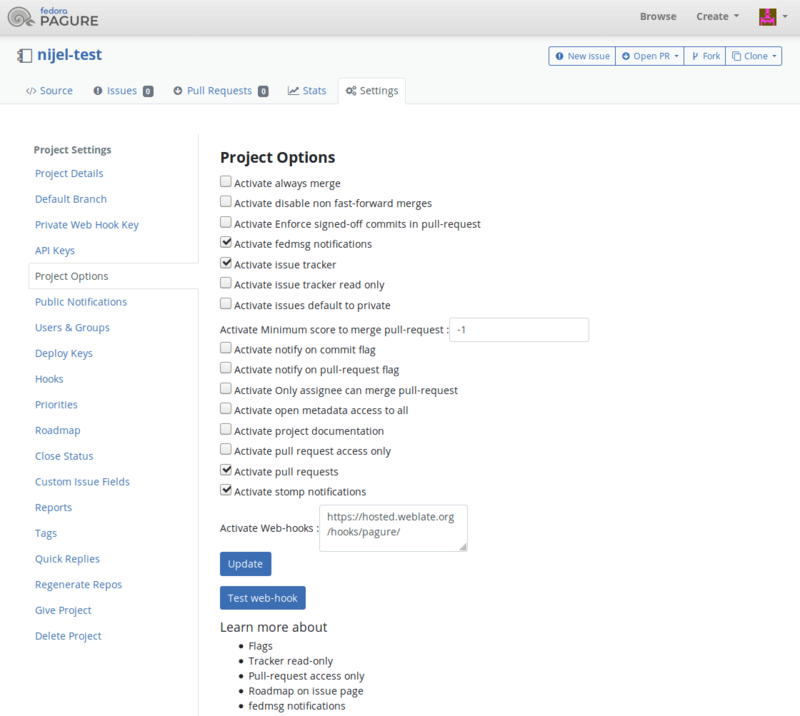 Each project can have a push URL set up, and in that case Weblate offers a button in the web interface to push changes to the remote repository. Weblate can be also be configured to automatically push changes on every commit. If you are using SSH to push, you will need to have a key without a passphrase (or use ssh-agent for Django), and the remote server needs to be verified by you via the admin interface first, otherwise pushing will fail. The push options differ based on the Version control integration used, more details are found in that chapter. You can also enable automatic pushing of changes on commits, this can be done in Component configuration. See Accessing repositories for setting up SSH keys, and Lazy commits for info about when Weblate decides to commit changes. For Hosted Weblate there is a dedicated push user registered on GitHub, Bitbucket and GitLab (with username weblate named Weblate push user). You need to add this user as a collaborator and give it permission to push to your repository. Let us know when you’ve done so and we will enable pushing changes from Hosted Weblate for you. By default, Weblate merges the upstream repository into its own. This is the safest way in case you also access the underlying repository by other means. In case you don’t need this, you can enable rebasing of changes on upstream, which will produce history with fewer merge commits. Rebasing can cause you trouble in case of complicated merges, so carefully consider whether or not you want to enable them. Weblate makes it easy to interact with others using its API. The behaviour of Weblate is to group commits from the same author into one commit if possible. This greatly reduces the number of commits, however you might need to explicitly tell it to do the commits in case you want to get the VCS repository in sync, e.g. for merge (this is by default allowed for the Managers group, see Access control). Somebody else changes an already changed string. A merge from upstream occurs. An explicit commit is requested. Change is older than period defined as Age of changes to commit on Component configuration. The way to customize how Weblate interacts with the repository is Addons. Consult Executing scripts from addon for info on how to execute external scripts through addons.